Plot: A rich but jealous man hires a private investigator to kill his cheating wife and her new man. But, when blood is involved, nothing is simple. 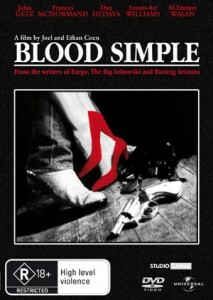 Coen brothers’ first step, firm and strong: Blood Simple has, over anything else, an uncontestable script, accurate, precise, which is the backbone of the film, accompanied by a solid technique and a sober sound and photography.